Has babyproofing made you see your bathroom in a completely new light? Do you find yourself noticing the slippery surfaces, cluttered counters, and all the other potential hazards? If so, take a deep breath — there are ways to fix this! There are essentials for babyproofing your bathroom that will help you find peace of mind and keep your baby safe. What areas should you focus on? Are there products to make it easier? Read on to make sure your bathroom stays a safe place for your little one. Of all the rooms in your house, the bathroom may seem easy to put last. After all, your baby won’t be mobile for the first few months of their life and you can lock bathroom doors. However, it’s strongly encouraged that parents address the task of babyproofing before their bundle of joy arrives. Why? There are few big reasons. You have so much to do with a new baby! You don’t want to miss a moment worrying about how your cabinets open or what’s inside your drawers. Starting early can build good habits. You can take more time to babyproof if you start early. The more time you have to perfect your home, the less stress you will experience. The best way to make sure you don’t miss anything when it comes to babyproofing an area of your home is to take your time. Go inside the bathroom and simply sit on the floor. See things from your child’s point of view. This exercise will allow you to see potential dangers and hazards you haven’t been aware of. As any parent can tell you, children will get into all sorts of places you’d never expect. If you have a solid base of defense built up, you can add little safety measures to places you didn’t see initially — which is way easier than doing the whole thing at once. We totally understand ensuring your baby is safe a huge necessity and babyproofing can be daunting. However, it’s not so difficult or scary if you handle it on a task-by-task basis. We don’t like to think about our toilets — in fact we use them every day and walk away without a thought. In order to babyproof your toilet, it’s a good idea to sit down and think about the different ways it could be dangerous. For example, many parents don’t think of the toilet as a drowning hazard. However, children can drown in as little as two inches of water (source). When you add the bolts at the toilet’s base, heavy lids, and streams of toilet paper it can be a potential disaster just waiting to happen. To prevent these disasters, here’s how to babyproof your toilet is five easy steps. 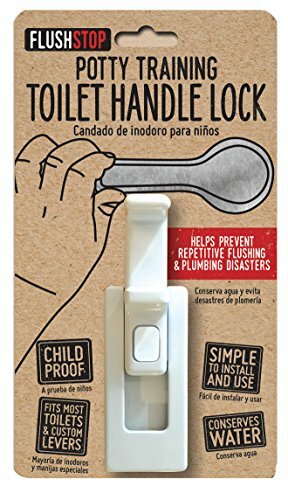 The most convenient way to babyproof your toilet (and entire bathroom) is to install a lock on the door that will allow you to lock it from the outside. The lock should be out of the child’s reach. There are three types of locks typically used for this essential task. Chain locks are commonplace, meaning you can find them easily and at varying price points. They can be installed quickly and are fairly simple to use. Simply screw the plate into the door and the chain to the frame. The chain has a knob of sorts at the end that slides into the plate and secures at one end. Barrel bolt locks are a bit sturdier than chain locks and leave little room for small fingers to get caught in the doorway. A barrel bolt lock comes with a tube-like piece of metal inside a barrel, which is then slid into a chamber. In order to open the door, the tube must be lifted up and slid out of place. A hook and eye lock is the easiest to open for anyone who can reach it. Simply place the hook in the eye to lock the door. This is a great option for keeping out younger children, but older children may use enough force to break the lock or figure out a way to reach it. With a lock on the door, you can easily get into the bathroom and out again. However, there are some disadvantages. You will have to train guests to lock the door behind them, and younger, but responsible children may not be able to reach the locks at all. Locks are also fairly permanent after you install them and visible. Consider installing a lock on a bathroom door your child is less likely to try and get into, so you don’t have to be as strict with the interior babyproofing methods. Children love to splash around in water — and an open toilet bowl provides a great opportunity. It also provides ample opportunity for trouble. Aside from potential drownings, toilet bowl lids can crash down on your little one’s fingers or bonk them in the head. If the toilet bowl is open, lots of items can get thrown in and flushed down. The easiest way to keep your toilet seat shut is with a lock. There are a number of different styles and designs available. Look in your local baby or hardware store to explore the best options for your home. You may even need a different kind of lock for each toilet, depending on how much access your child has to each bathroom. Toilet seat locks are not always the most convenient for adults. Can you envision a stream of toilet paper around your bathroom or stuffed inside your toilet bowl? As fun as it is for your child to pull all of the paper off an entire roll, it’s certainly a headache to clean up! Use a toilet paper saver to prevent little hands from having too much fun and wasting too much paper. In case you think this isn’t a real-world issue, one of the most popular versions of this product was even invented by moms. You also want to make sure you store excess toilet paper somewhere inaccessible to your child, but easily available for adults. Make sure to throw away toilet paper packaging. It can become a choking and suffocation hazard if it’s nearly empty. For obvious reasons, your toilet is bolted into place. There’s a good chance your toilet bolts already have caps to eliminate sharp corners. Double-check to ensure caps are present and if they come off easily. If your toilet’s base does not have caps, a long bolt will be sticking straight up. Depending on the type of toilet bowl cap you purchase, you may need to saw the bolt down. However, many caps are designed to screw right on with ease. Prevent your child from flushing anything down the toilet by locking the handle. You can do it easily with a product like this. Simply attach the lock to the toilet underneath the handle. The lock basically works as a stopper, preventing the handle from being pushed down all the way. Press the red button to release the lock, which will allow you to press the handle down. Two-thirds of drownings that occur in the home take place in the bathtub. While the number one thing you can do to prevent any sort of danger to your child in the bathtub is supervise them there are a few other things you should know. These simple ideas, correctly implemented, can ensure bath time remains safe and fun. Place a non-slip mat on the bottom of your bathtub. This will ensure your child does not slip when they are inside the tub. It can be very easy for your baby or toddler to tumble right over, even if they’re just sitting! Two types of non-slip bathtub mats are common: a mat that runs the length of the tub, or a set of individual tub stickers. These can be especially fun for children as they come in all different shapes and patterns. Regularly check your non-slip mat to ensure it hasn’t worn down, become loose, or developed mold or mildew spots. When you place your toddler in the tub, you may notice their height is fairly even with the water spout — primed and ready for a bonk on the head! This presents a potentially painful and dangerous hazard. Many mothers love cute spout covers to add some fun to bath time while protecting their children. 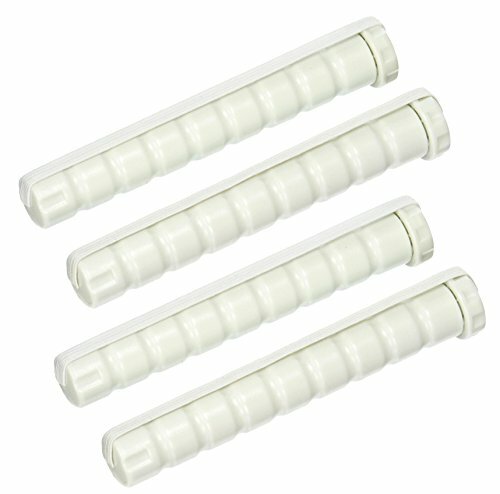 The covers go right over the spout and are generally made of soft rubber or silicone. While you want your child to enjoy the spout cover you purchase, it’s important you emphasize it’s not a toy and cannot be easily removed. Looking for a way to save water and keep bath time safe? A tub separator, or divider, allows you to section off a part of your tub — so you can even get into the tub without getting wet. A tub separator helps keep your baby safe because it limits the amount of room your baby has to navigate inside the tub and helps you control their environment. When you have an infant, you typically use special tubs and seats for bathing. As your baby gets bigger, you don’t have to ditch this safety method. You can use a full-sized tub while still keeping your baby contained. Bathing seats for full-sized tubs allow room for your baby to move and splash while sitting up. Inflatable safety tubs, which mimic bathtubs, are also available. As your child grows, the type of bathing seat appropriate for them will change. Make sure to read all of the information provided with each seat you buy to determine when you will need a change of product. The bathtub is the most dangerous when left unsupervised. This is true even if it’s not filled with water or in use. From shampoos and washes to toys, there are any number of things your little one can get into! 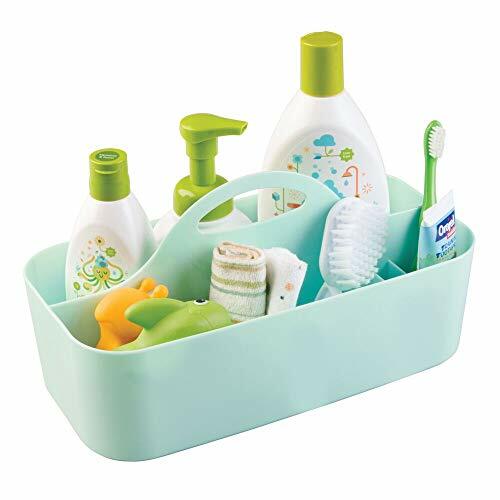 Limit your stress by keeping everything you need in one place such as a bath organizer or caddy! Gather up the shampoo, toys, cloths, and whatever else you may need and put them in an organizer. It can be as simple as a plastic tote. There are also a number of mesh organizers you can store bath toys in. Store these items up high when you’re done with bath time. You don’t want to risk your little one getting into them when you’re not around. Children love to explore — and they have an uncanny ability to get into everything. If your bathroom cabinets are not locked, they can explore hair styling tools with long cords, soaps and shampoos, medicines, and even poisonous cleaning materials. Follow these step-by-step instructions to babyproof your bathroom cabinets without stress. Remove hazards: Take any poisonous or hazardous materials and move them to a higher cabinet. Even if an item seems harmless, ask yourself if you want your child to have access to it. Audit items: Simply leaving cabinets empty is not a great choice for busy moms and dads who need to make the most of their space. Some are safe to leave within reach. A few items you can keep in your bathroom cabinets are towels, clean sponges, unopened packages of toilet paper, and a scale. Purchase locks: The easiest way to ensure your child does not get into your bathroom cabinets is with cabinet locks. There are many different kinds available, including magnet locks, sliding locks for side-by-side handles, and cord locks. The goal with babyproofing your bathroom cabinets is to keep dangerous things out of your child’s tiny hands while still having access to everything you need. Experiment with a few different types of locks to find one that works best for you. What sort of bathroom person are you? Do you keep all your toiletries on the counter or organized in drawers? If you find yourself in the first group, now is the time to make a change! Leaving stuff on the counter may entice your child to start climbing. Remove the temptation by keeping everything hidden away in locked drawers or cabinets. This is the simplest step to babyproofing your bathroom counter. However, there are a few other things you should keep in mind. Never leave hair styling equipment turned on and unattended when a child can get to it. This includes curling irons, hair dryers, and flat-irons. If you turn your back for one moment, they can grab the cord and pull it down. Add corner guards to your bathroom counters. As your child grows, they will likely start climbing and exploring things. You don’t want them to climb up on the toilet and fall, hitting their head on a sharp corner. In the same arena as climbing, remove or lock away any apparatus that could be used as a stepping stone — this includes step stools. If your child can get on top of the toilet, which is dangerous in and of itself, then they can reach onto the counter. Want to go the extra mile? When it comes to babyproofing your bathroom, paying attention to small details can make all the difference. Toilet brush: Does it give you the shivers to think of what’s on the end of your toilet brush? Us too! Keep your toilet brush somewhere your child can’t reach it, like under a locked cabinet in the sink. Shower curtains: Mold and mildew can grow on shower curtains, so find a shower curtain made of vinyl or nylon for easy cleaning. Keep an eye out for mildew resistant in the description. Shower rods and rings: Invest in a strong shower rod and shower curtain rings. As your baby grows, there’s a good chance they’ll tug and pull on the shower curtain. Make sure the rings and rod can hold your child’s weight to avoid a nasty crash. Water temperature: Your child’s skin is sensitive. Hot water can easily irritate or even scald their skin. Get a special thermometer to make sure your baby’s bathwater is the perfect temperature. Garbage: The trash can in a bathroom gets some of the more germ-filled pieces of trash in the entire household. If not looked after properly, it can end up all over the floor. Get a trash can with a lid for extra security and make sure to take it out regularly. If you are able to, place a small trash can in a locked cabinet. One of the most important things you can do to help your child be safe in the bathroom is to teach them bathroom etiquette and why they’re not allowed to do certain things. This is an especially important aspect of potty-training. You want your child to be able to use the bathroom properly and make the learning process as stress-free as possible. It’s not always easy to babyproof an area while still providing an environment your child feels comfortable in. Strive to create at least one bathroom in the house just for your children so they can have a place to learn and grow while still being safe. You can do this by using bright colors, child-friendly toys and decor, and special products your child can use without supervision as they grow older. By following the tips listed in this article, you’ll be well on your way to having a safe, yet functional bathroom for your entire family. Parents with children of all ages understand just how overwhelming babyproofing the bathroom can be. We suggest starting with one section at a time so you don’t have to strain to do everything at once. How did you tackle hazardous products and slippery surfaces? Let us know in the comments below! If you know a mama in the middle of a babyproofing mission, share this article with them and spread the knowledge! What are the Best Cabinet Locks for Babyproofing? What are the Best Shopping Cart Covers? What Are The Best Baby Safety Helmets?